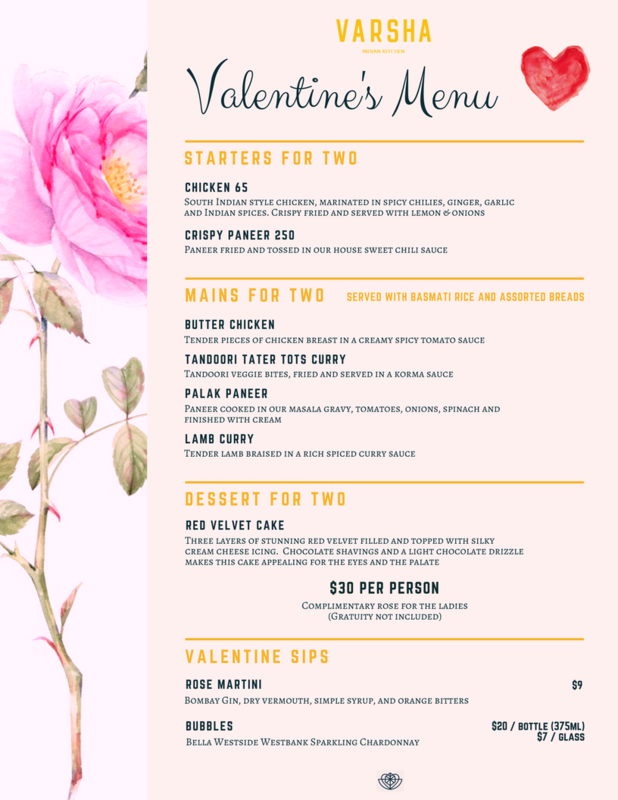 A 3-course meal to share with your valentine for $30/person. All items on the menu is limited only for February 14, 2019. Make it special. Book a table. Come in during Dine Around Victoria 2019 and try both of our special tasty 3 course meals! Choose either our $20 or $40 menu with some local wine or beer. 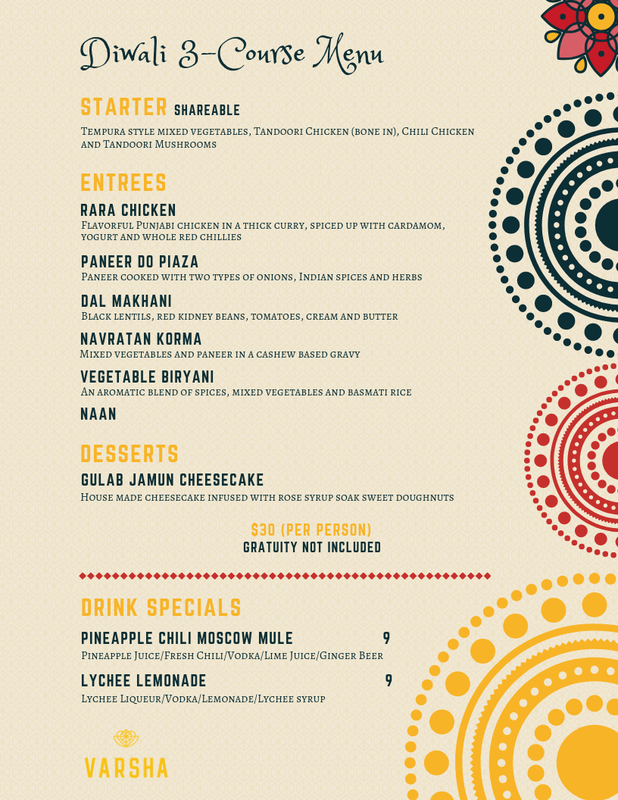 Come to Varsha and enjoy a 3-course dinner to celebrate Diwali - a festival of lights. As usual, all dishes on the menu are just for the day. It will not be like any other days at Varsha! Plus, each person can have ALL the dishes on the menu, which include all the entrees, the starter and the dessert for $30! See below. When: From 6 pm till close on November 11 (Sunday). November 7, is Diwali - a festival of lights celebrated every year in autumn and also one of the most popular Hindu festivals. It spiritually signifies the victory of light over darkness, good over evil, knowledge over ignorance, and hope over despair. Come and enjoy our family's newest innovative dishes and modern Diwali vibes. Poutine is good. What’s better, is eating poutine guilt free! Spend a special Mother’s day at Varsha. Students, show us your student ID and get your discount! Promotion ends on February28, 2018. For more details, please see the discount card. Come & hang out with us at India Mela this coming weekend! India Canada Cultural Association presents you the 8th annual India Mela! Varsha family will be contributing a food truck and feeding all the happy people at the festival. The 3-day cultural event will be held at the Centennial Square / City Hall in downtown Victoria on August 11th—August 13th, 2017. Come and celebrate a weekend full of food, music, dance, arts, fashion and much more from a variety of cultures. Canada has been the home of our family. We love our country and we wish Canada the best for its future. Therefore, we are donating half of our sales of July 1st, 2017 to Children's Health Foundation of Vancouver Island, because our children are our future. 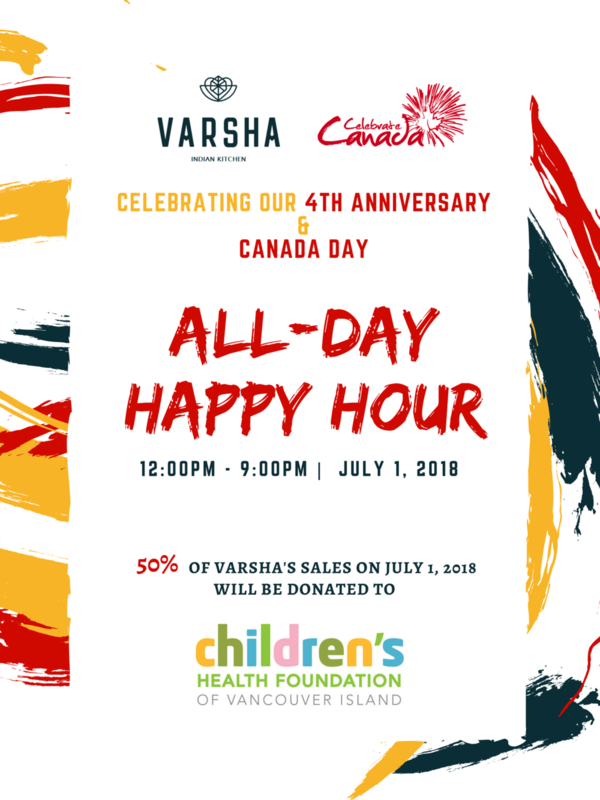 Stop by on July 1 as we celebrate Canada's birthday, as well as Varsha Indian Kitchen's anniversary. Enjoy our food and help us make the world a better place for kids. Varsha Indian Kitchen is Turning 3! Our family is turning 3 on July 1 this year! Yup. We are surely young and you can say we are still new to the world, but with your love and support along the way, we have grown SO MUCH and SO FAST. From the first meal we served to our latest "Best Restaurant in Victoria" awards, we would be where we are if it was without you all. From June 27, 2017 - July 2, 2017, post a picture on Instagram, Twitter or Facebook with the hashtag #varshaturns3. Then you have a chance to win a $50 gift card from us! Easy and simple. The winner will be contacted in the following week. Let's put a smile on her face! Come to Varsha and enjoy our Mother's Day menu. Our Indo Canadian fusion cuisine will bring you a pleasant night full of great food and love. St. Patrick's Day at Varsha! Join our family on St. Patricks Day for some Indian dishes with an Irish twist! Join our family this Valentine's Day, Tuesday, February 14th for a special 3 course dinner with someone special!